The final season of Disney Channel’s trailblazing comedy series, Specially packaged to include all 13 final season episodes, this exciting release also contains an exclusive alternate ending to the series finale; a series retrospective; cast goodbyes and an all-new collectible memory book; a Hannah Montana photograph with signature and much, much more – it’s the perfect tribute to the end of an era! 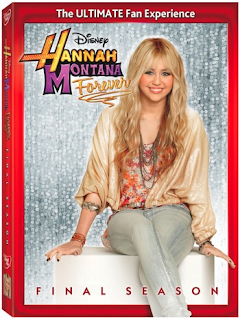 Giving fans of all ages the chance to complete their DVD series collection, Hannah Montana Forever: Final Season beautifully concludes the laughter and fun of Miley Stewart’s (Miley Cyrus) high school adventures while also unveiling her big superstar secret. For those who have followed Hannah Montana for four-plus amazing years and are ready to see how it all ends, Miley Stewart has found herself at crossroads during her senior year. After all these years, does she still have the best of both worlds? Can she continue her alter ego, Hannah Montana, or will she leave it all behind to be an ordinary girl? This exciting release invites viewers to come join Miley, Lilly, Oliver, Robby Ray, Jackson, Rico and special guest stars Sheryl Crow, Cody Linley, Dolly Parton and more as they bring the groundbreaking and beloved series to a close. We have enjoyed watching Hannah Montana for the past few years with the kids. As a family friendly comedy it's a show that our entire family can sit down and watch together. We have all watched as Miley has grown up , so we were excited to see how the show concludes in Hannah Montana Forever: Final Season. The DVD is packaged wonderfully for the ultimate Hannah Montana Fan (including a Collectible Memory Book that's comprised of trivia and background on the show and it's star cast)....the perfect way to complete our collection! I won't spoil it for you and tell you how the show concludes....I'll just say that it's a GREAT ENDING! Released March 8, Hannah Montana Forever: Final Season is available NOW at a Retailer NEAR YOU! Commission’s 16 CFR, Part 255.